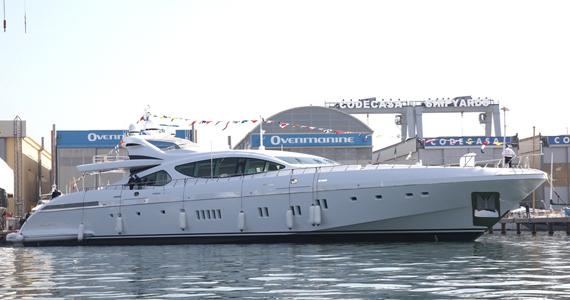 The latest Mangusta 165 superyacht – the seventh since the range was introduced – has been launched in Viareggio by the Overmarine Group. The yacht will be delivered to her owner in time for a summer of cruising in the Mediterranean before being shipped to US in time to be shown at the Fort Lauderdale Boat Show in October. The 50-metre 165 delivers a staggering 40 knots. The interior is the work of Overmarine’s design team with a four-cabin layout comprising a full-beam master cabin, a spacious VIP and two guest suits. There is also room for a gym below. The flybridge boasts a second helm station, as well as dining and sunbathing areas. On-board toys include an inflatable slide. The yacht has yet to be named.